In Which Our Intrepid Reporter Travels to the World's Worst Places and Asks, "What's Funny About This?" A “hair-raisingly hilarious” journey through danger zones from Belfast to Gaza, by the #1 New York Times–bestselling author (Vanity Fair). 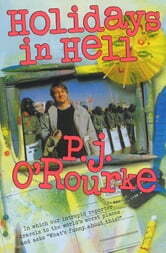 “Tired of making bad jokes” and believing that “the world outside seemed a much worse joke than anything I could conjure,” journalist and political satirist P. J. O’Rourke decided to traverse the globe on a fun-finding mission, investigating the way of life in the most desperate places on the planet, including Warsaw, Managua, and Belfast. The result is Holidays in Hell—a full-tilt, no-holds-barred romp through politics, culture, and ideology. The author’s adventures include storming student protesters’ barricades with riot police in South Korea, interviewing Communist insurrectionists in the Philippines, and going undercover dressed in Arab garb in the Gaza Strip. He also takes a look at America’s homegrown horrors as he braves the media frenzy surrounding the Reagan-Gorbachev summit in Washington DC, uncovers the mortifying banality behind the white-bread kitsch of Jerry Falwell’s Heritage USA, and survives the stultifying boredom of Harvard’s 350th anniversary celebration. Packed with classic riffs on everything from Polish nightlife under communism to Third World driving tips, Holidays in Hell is one of the best-loved books by “one of the funniest writers in America” (Time).